Marissa and Phillip had a vision of providing a family friendly farm stay, which not only appealed to children, but to adults also. Marissa and Phillip had a vision of providing a family friendly farm stay, which not only appealed to children, but to adults also. They figured that if the children were happy so would the parents be. Farmer Phill transporting a new calf. FRESHWATER CREEK COTTAGES land was originally in a parcel of land owned by the local farming family the Johnsons. The Johnsons still operate farms in the area.The first building on the farm “The Lodge” was brought here from Colac. “The Lodge” was the old stationmasters house at the Colac railway station. A few additions were added over the years, however most of the cottage is in its original form. The Johnson’s divided up some of their farmland and sold off 50 acres in the early 1980’s to a Geelong family, The Nobles. Those 50 acres would be the start of Freshwater Creek Cottages. The Nobles came to Freshwater Creek with a vision. In that vision was a cottage accommodation business. Freshwater Creek Cottages first opened its gates in 1989. The Nobles meticulously planned out each of the cottages and put in so much groundwork up until they sold the property in the year 2000. The tennis courts, fruit orchard, and olive grove are all here thanks to their hard work. The Nobles still live in Freshwater Creek and enjoy visiting our farm and seeing all the changes. Phillip and I purchased the farm in May 2012. We then moved here from Western Australia in December 2012 and started the massive job of bringing the cottages back to their former glory. We both come from a construction background, where our families had construction businesses that we both worked in. This knowledge and skill set has proven to be very valuable. Since arriving here we have undertaken massive work on the farm. Complete renovation of all cottages was high on the agenda, secure fencing, gorgeous gardens, fun play areas along with edible gardens were also on “the list”. 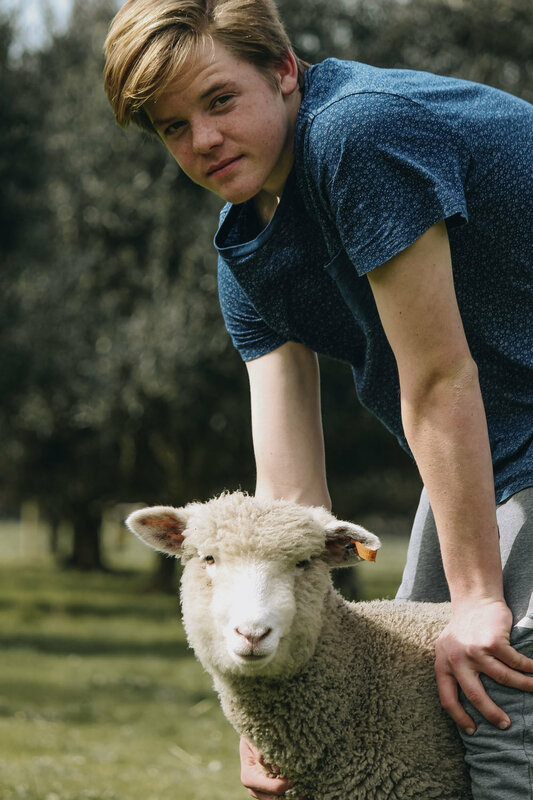 Phillip and I had a vision of providing a family friendly farm stay, which not only appealed to children, but to adults also. We also figured that if the children were happy so would the parents be. We are trying to provide quality accommodation in a gorgeous setting filled with activities and learning opportunities for all. Little did we know that we were actually learning so much ourselves!! Phillip serving up lunch on the farm. We have replaced half of the boundary fencing, and most of the internal farm fencing. When we arrived there was just 4 cows on the property. We now have a healthy stock of a variety of farm animals that all lead a pretty good life. We realise that we are living on a beautiful and slowly becoming rare piece of land. We try our best to replenish the soil and trees etc. We are constantly planting new native trees and bushes to support the wildlife. Bees are particularly important to us, and we will continue to plant more and more flowering native plants for them. The farmland itself has needed a lot of nurturing, and we have done this with lots of organic help. We compost all our green waste on site and return this to our paddocks, fruit orchard and gardens. We put up to 100 cubic meters of organic matter back on to the farm each year. The fruit orchard has undergone massive work. The fully netted and enclosed orchard now has fertile soil, which helps with the production of over 1000kg of fruit each year. One plum tree alone can produce over 100kg of fruit. We are in the process now of planting young fruit trees in the preparation for some of the older trees that are on their way out. Zeb, Tom, Jack and Charlie the dog. Our family consists of three boys, Jack, Tom and Zeb, along with 3 dogs, Charlie, Millie and Charlotte. They are all very privileged to live here, and it is something that we remind them all the time. We have a no “I” policy on the farm during the day for our children. Whilst the sun is shining they are not allowed inside, and during daylight, no Ipads or other devices are allowed. The boys each have to do about 1 hours farm work after school a day, followed by about 8 hours over the weekend. School holidays tend to be a working holiday for them also. 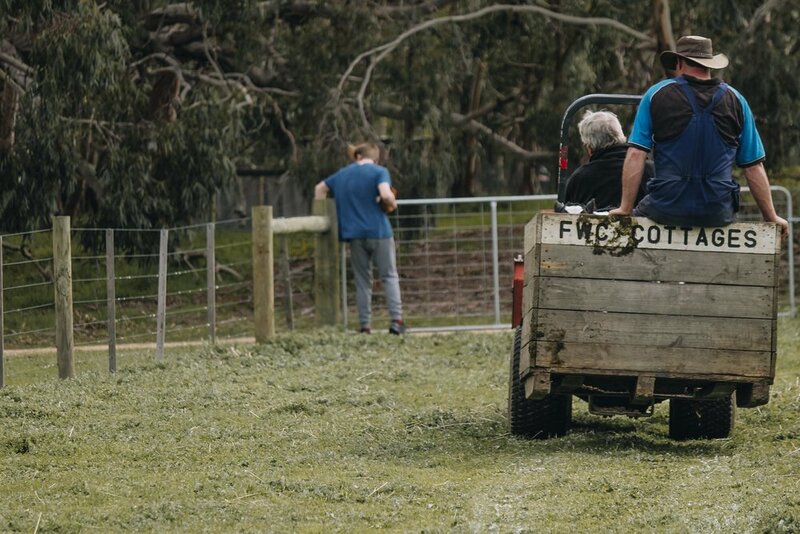 They help with everything from bottle feeding the animals, delivery animal feed, cleaning the paddocks from manure, collecting firewood, splitting firewood to even cleaning the cottages. For the most part they love sharing their farm with guests, and are usually amazed by peoples reaction to tasting our fruit or seeing fruit grown on trees. They are learning so much on a daily basis from our guests, an upside we didn’t really think about. The boys over the years have made solid friendships with returning guests, and this is great to see. Most days you will also see my parents out at the farm. My dad, Paddy, and mum Rose, help is all areas of the farm. Mum can always be found at the washing line, whilst dad is always tinkering near the shed or carrying out maintenance on the cottages. Pretty much all the woodwork around the farm including the signage, gates etc., my father has made. It is fantastic having them out here and helping and sharing this experience with us. On our journey so far we have been so lucky to surround ourselves with a wonderful team of employees that help us. The farm stay is very labor intensive and there is no way we could do it all ourselves. I would be and will be lost if we didn’t have such a great team supporting us. We really hope you are enjoying your time with us. Feel free to come and chat to us as we do our daily jobs. If you want to pitch in and help, we will only be too happy to have you involved. We thank you for coming to stay, and really hope that you created some wonderful memories with your loved ones. 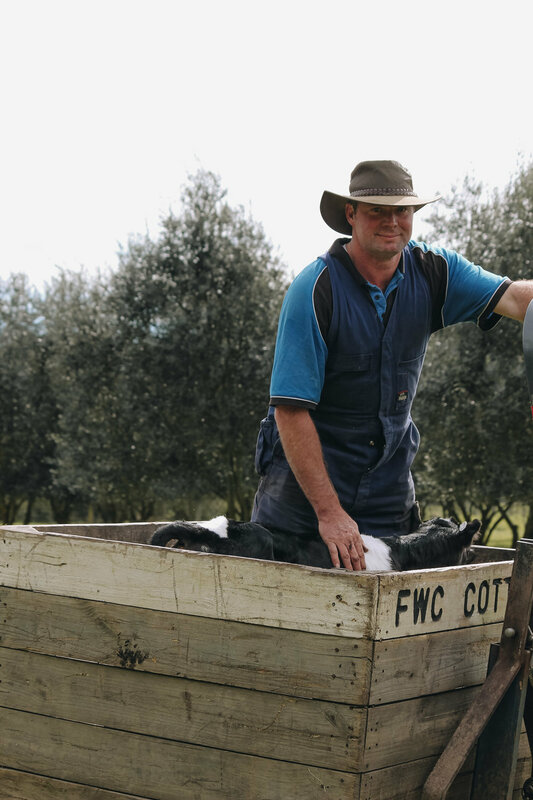 We truly love sharing our farm with you, and hope that you share your experience here with others. Our best guests are you guys! We love returning guests, so make sure if you want to come again to speak to us about our returning guest discount. As a friend of ours you will never pay full price to stay here again!! Marissa, Phillip and all at Freshwater Creek Cottages. Marissa and Phillip with their three sons, Jack, Tom, Zeb and Charlie the dog.